President-elect Donald Trump's impact on Apple stock in the days after the election was decidedly negative, lopping nearly 5% from the AAPL share price. At the same time, the rest of the market was moving up about 2%. But a Donald Trump presidency is nowhere near the threat to Apple stock that so many seem to think. Granted, President-elect Trump said a lot of things during his controversy-filled campaign that could harm Apple Inc. (Nasdaq: AAPL) and other tech companies. But not all of these worst-case scenarios will come to pass. And some of Donald Trump's proposals would actually have a positive impact on AAPL stock. Investors should note that in the days since his surprise victory, Trump has softened his positions on several major campaign issues, such as Obamacare and immigration. That migration away from some of his most controversial rhetoric suggests Trump could also back off from positions that would have a harmful impact on Apple stock. 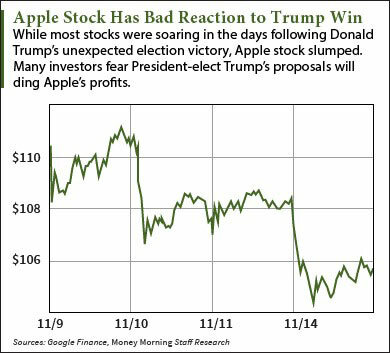 Despite the drop in the AAPL stock price, Apple investors don't have much to worry about from Trump's campaign talk. Most of the proposals that would threaten Apple stock are impractical and will survive only in a watered-down form – if at all. It's fairly well known that while Apple designs its products at its Cupertino, Calif., headquarters, nearly all Apple products are manufactured overseas, mostly in China. Only the pricey, low volume Mac Pro desktop is made in the United States, in Austin, Texas. So Apple was a frequent target in Trump's crusade to bring jobs home to America. "I'm going to bring jobs back," Trump said in a campaign speech on March 1. "I'm going to get Apple to start making their computers and their iPhones on our land, not in China. How does it help us when they make it in China?" To make this happen, Trump proposed a 35% tax on businesses manufacturing their products in foreign countries. Complying with such a policy would be costly for Apple, and would raise the prices of the iPhone, iPad, and most Macs. Odds this will happen: Very, very small. One reason Apple and other consumer tech companies use overseas manufacturing facilities is that the United States simply doesn't have enough qualified workers. Another is that most of Apple's supply chain is located in Asia. Shipping the parts to the United States for assembly would create serious logistical problems. Imposing a punitive tax on companies like Apple would create havoc with U.S. businesses, make many goods more expensive, and send the U.S. economy reeling. And because of factory automation, this policy would not bring back as many jobs as hoped. Trump will back away from this promise. Like many tech companies, Apple makes liberal use of the H1-B visa program, which allows foreign workers to live in the United States temporarily. (Think Rajesh Koothrappali of "The Big Bang Theory.") The H1-B program fills a gap because the U.S. doesn't have enough of the highly skilled tech workers needed in Silicon Valley. Losing access to these foreign workers would hamper Apple's ability to develop its premium products. During the campaign, Trump contradicted himself several times when speaking of the H1-B program. While he said he believes the program deprives Americans of jobs, he also said he supports the idea of retaining smart, talented foreign workers who attend college in the United States. Odds this will happen: Close to zero. Trump's confusion on H1-B visas suggests it won't be a priority and that he is open to persuasion from those who would oppose changes to it. On the campaign trail, Donald Trump frequently criticized America's relationships with its main trading partners, especially China. Trump suggested imposing a tariff on China as high as 45% to make domestic U.S. goods more competitive and bring back jobs, in theory. But no country would sit still for such a punitive measure. And yesterday (Sunday), China fired a warning shot that mentioned Apple's flagship product, the iPhone, by name. "If Trump wrecks Sino-U.S. trade, a number of U.S. industries will be impaired," state-run Chinese newspaper Global Times said in an editorial. "A batch of Boeing orders will be replaced by Airbus. U.S. auto and iPhone sales in China will suffer a setback, and U.S. soybean and maize imports will be halted." 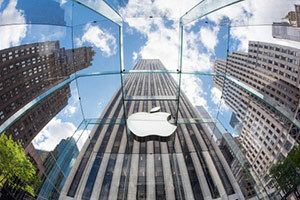 Any damage to iPhone sales would hurt Apple stock. Sales of the iPhone generate about two-thirds of the company's revenue. And the Greater China region accounts for about 18.75% of Apple's sales. Odds this will happen: Low, and falling. A trade war would be an economic nightmare, gutting U.S. productivity and triggering a recession, if not a depression. With China signaling it won't tolerate any U.S. moves to raise trade barriers, Trump will need to tread carefully. He may feel the need to impose a tariff to save face, but it will be small enough to avoid a full-blown confrontation with China. Trump Impact on Apple Stock No. 4: iPhone "Backdoors"
When Apple refused a request from the FBI to break into an iPhone that belonged to one of the attackers in the San Bernardino mass shooting, Trump sided emphatically with the FBI. "Apple ought to give the security for that phone, OK?" Trump said in a February speech. "What I think you ought to do is boycott Apple until such time as they give that security number. How do you like that? I just thought of it. Boycott Apple!" As president, Trump might seek changes to regulations that would require Apple and other tech companies to comply with similar requests in the future from law enforcement agencies. Odds this will happen: Unless advisers talk him out of it, there's a good chance Trump will try to do this – especially if another terror incident raises the issue. While this attack on privacy would be bad for Apple (and all U.S. citizens), any new rules would apply to all devices, so at least Apple wouldn't be singled out.